My typical Saturday blog post is a bit late because I was out of town this weekend and didn't have internet reception to be able to post anything. I spent the weekend at my mom's house with my younger sister and brother, his wife and their two-year old niece. The weather was absolutely lovely and it's getting me excited for fall to finally arrive in Texas. I consider this first one the most elegant and formal of the three. I thought it'd be fun to try my hand at making a more curved upholstered headboard and I think the damask pattern (in the bedding and Spoonflower fabric) would work well in their Tuscan-inspired retirement home. 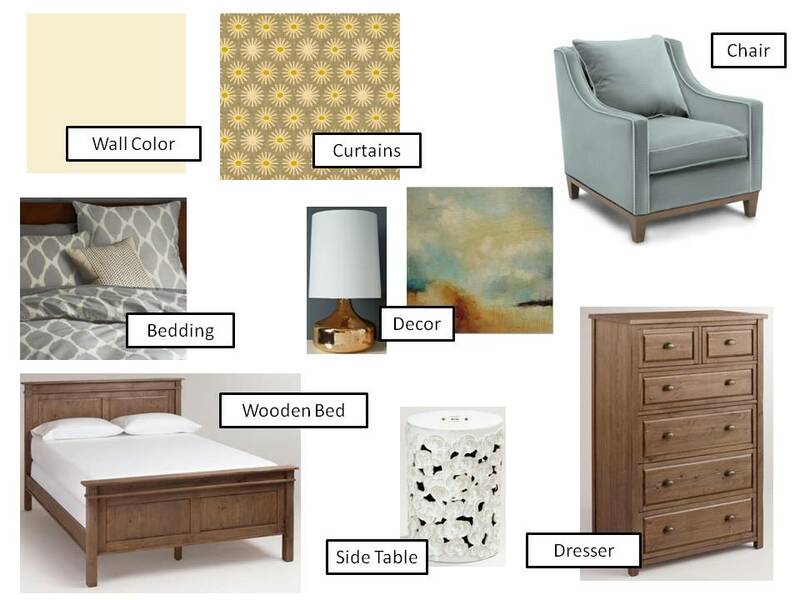 I love the warm color scheme of this style, the gold lamp reminds me of a sink they're using in the powder room, and the curtain fabric makes me think of a country field full of sunflowers. I am also seriously crushing on the latest trend of using fun-patterned and bold colored ceramic stools as side tables. I pulled in the damask pattern again here in the side chair, and thought that they would especially like bringing in reds and yellows in this space. Sure enough, this board was my mother-in-laws favorite! 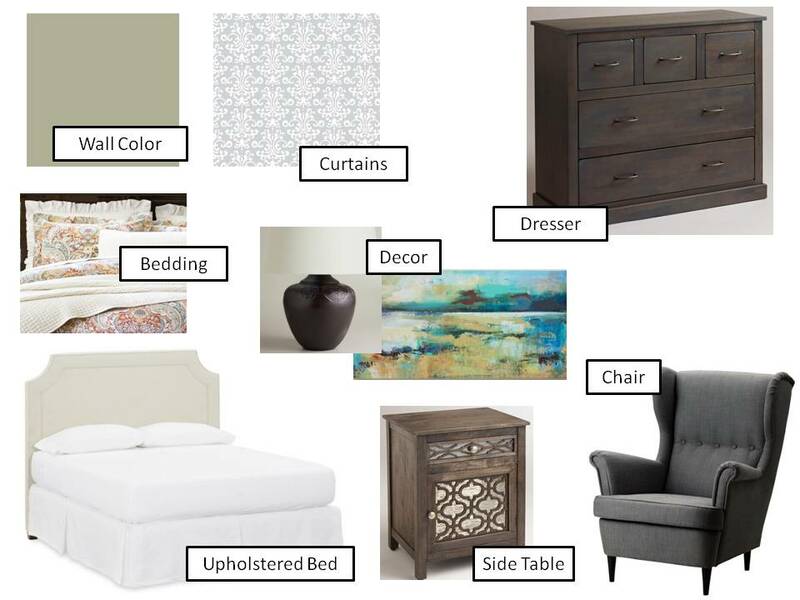 I like the look of painted wood alongside dark-stained wood furniture and think this might work well for the furniture they already have that needs a little updating for their new house. Besides spending my weekend perusing furniture sites and dreaming up potential guest room designs for my in-laws, I also enjoyed the cooler weather and Keith and I got a lot of walking and outdoor exercise in. Unfortunately one of my ankles has been acting up off-and-on for the past few weeks so I tried to take it easy this week and instead of joining Keith for our planned 14-mile long run, I biked alongside him and cheered him on. On a quick brave act note, I wrapped up September by going to an acupuncturist for the first time, the last day of the month, and found it very relaxing. Which was much needed heading into my October brave act - watching as many scary movies as I can handle. I hate scary movies, but so far I have gotten through Resident Evil (by myself!) and [most of] Scream. That last one was a bit too much for me mainly because I'm home along for the majority of the week and late into the evenings. Next I'm thinking some older horror movies might be fun - The Birds, Psycho and Nosferatu. I'll let you know how the rest of the month goes! 1) Wall Color - Sherwin-Williams Zero VOC SW 2860 Sage. Bedding from Pottery Barn. Curtains from Spoonflower. Side Table from World Market. Chair from ikea. Dresser from World Market. Lamp from World Market. Painting from World Market. 2) Wall Color - Sherwin-Williams Zero VOC SW 7121 Corona. Bedding from West Elm. Curtains from Spoonflower. Side Table from World Market. Wooden Bed from World Market. Chair from Williams Sonoma. Dresser from World Market. Lamp from West Elm. Print from West Elm. 3) Wall Color - Sherwin-Williams Zero VOC SW 6329 Faint Coral. 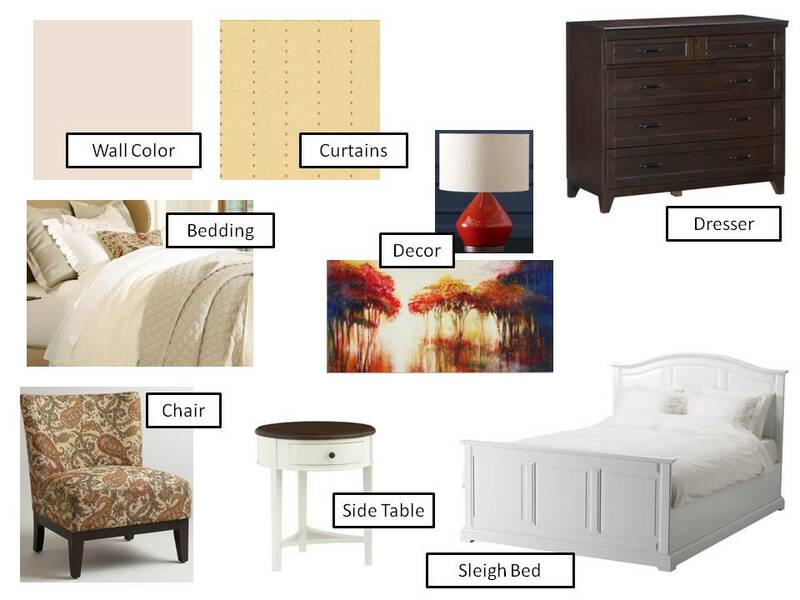 Sleigh Bed from ikea. Curtains from Spoonflower. Chair from World Market. Side Table from Crate & Barrel. Dresser from Pottery Barn. Bedding from Pottery Barn. Lamp from West Elm. Painting from World Market.